The founder of Grameen Bank, father of microcredit and the concept of social business, which are now being implemented all around the world. Nobel Laureate Professor Muhammad Yunus, the founder of Grameen Bank, and of more than 50 companies, in Bangladesh, each aiming at addressing a specific social problem, father of microcredit and the concept of social business, which are now being implemented all around the world. Professor Muhammad Yunus is the recipient of more than 50 honorary degrees from universities across 20 countries. He has received 112 awards from 26 countries including state honours from 10 countries. 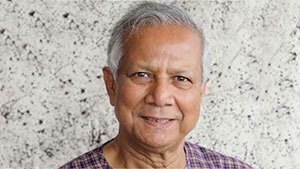 Professor Yunus was the 2006 recipient of the Nobel Peace Prize together with Grameen Bank. Other notable awards include the Ramon Magsaysay Award (1984), World Food Prize (1994), International Simon Bolivar Prize (1996), Sydney Peace Prize (1998) and Seoul Peace Prize (2006). He is one of seven individuals to have received the Nobel Peace Prize, the United States Presidential Medal of Freedom and the United States Congressional Gold Medal. For his constant innovation and enterprise, the Fortune Magazine named Professor Yunus in March 2012 as “one of 12 greatest entrepreneurs of our time.